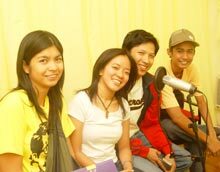 UP Diliman Journalism students at the FNF Podcast studio. University of the Philippines-Diliman (UP) Journalism students visited the Friedrich Naumann Foundation office to interview Resident Representative Dr. Ronald Meinardus on The Liberal Times Manila Podcast, his thoughts on this new audio technology and its future prospects in the Philippines for their communications research course. They also toured the Foundation’s home-made studio, looked into Podcasting software and did some recordings of their own to get a first-hand feel. Group representative Glenn Perez remarked that the Foundation was on the right track in getting its message across. He mentioned that when doing an online search on Podcasts in the Philippines, The Liberal Times Manila came up on the top of the list.